Yay!!! It is March Giveaway Time!! 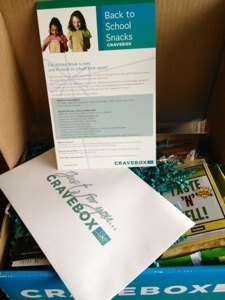 This month you can enter to win one of two CraveBox Back to School Snack Boxes! Read my review here! Hint: Follow my blog before clicking either of the above links! This contest will end at Midnight on March 25th and after all entries are verified as valid at that time, I will announce the winner! Happy March and Good Luck to Everyone!! I think I’m most excited about the fruit strips. I’d love to try the veggie stix. The Sunrype Fruit Strips sound pretty tasty!